This wallpaper was making me crazy (were used more than a hundred layers). I was looking for scans in google and saw a huge scan of Kagami dressed like a mermaid. I liked the scan and later when I saw the Konata's scan here in Minitokyo (here: http://gallery.minitokyo.net/view/417189), I imagined this wall. And vectorized a photography of damselfishes. The weeds and corals were handmade. Browse Lucky Star Gallery: Recent | Popular. 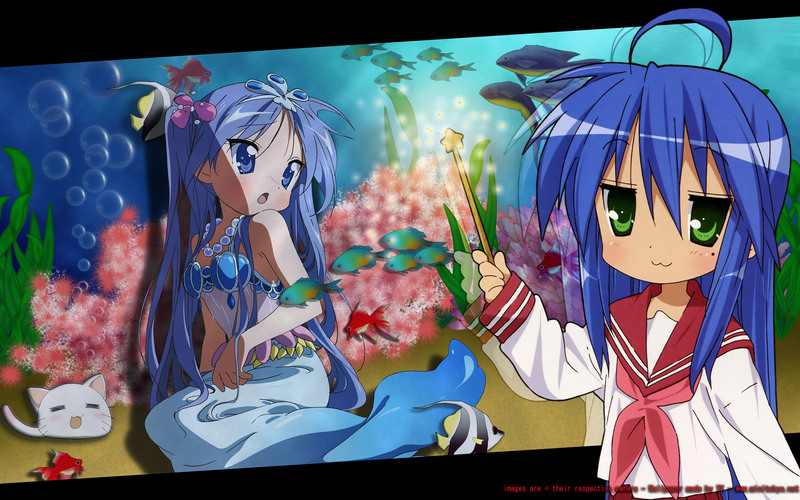 Wow, pretty nice wallpaper, all elements are integrated well in the background and in the next planes, i can see just two elements that look a bit strange, the contrast between Konata and the bottom planes is to high, maybe if you turn Konata a little more to the white, just 5 o 10% more light in that layer to make Konata colors more soft, i think this could make a perfect wallpaper integrating Konata with all other elements. The other strange element are the credits, but i think is understandable to put them in red, although i prefer them in another color with less contrast with the wallpaper. mind to make a Kagami focus mermaid BG? Thanks for sharing this awesome wallpaper! It makes me smile just to see it (I don't know why, maybe it's just Konachan), and at the same time I admire the amount of details and the hard work you have put into it. Keep up your good work! ahhhhhmm...Kagami chan...kawaii...all wallpaper is good...excellent quality...10x 4 share! Remade the extraction and uploaded again. And tks for the comments everybody posted. Great job on the wallpaper. Well done!